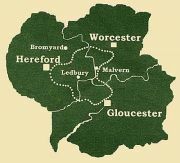 A route between Gloucester, Hereford and Worcester through countryside of hop-yards, vineyards and orchard with a theme linking the walk to the ancient music festivals still celebrated annually in the three Cathedrals. The rivers Severn, Wye, Teme and Lugg are crossed as are the Marcle and Malvern Ridges and the Suckley Hills. The Way connects with the Worcestershire, Gloucestershire, Wysis and Severn Ways and the Wye Valley Walk.